Leading children’s programs by day. Playing saxophone in a cover band by night. It’s all in a day’s work for Erin Leiter. Leiter, the young people’s assistant at Elkhart Public Library’s Cleveland location for about the past two years, spent much of her career in Concord Community Schools as a paraprofessional. This isn’t her first job in the EPL system. Leiter said she worked at the downtown location in the children’s room about 25 years ago. “I had worked in libraries since high school, and it seemed like a really good fit. It came around at just the right time,” she says of her current position. Leiter enjoys planning the programming at the Cleveland Branch, especially the storytimes. “It’s a way for moms especially, but also grandparents, to meet with people in the same stage in life. (It’s also) a chance for kids to build components of literacy and those skills that they’ll use later in their life,” she says. Leiter also has enjoyed coming up with creative new ideas for her events. One of her favorites has been the stuffed animal sleepover, when children bring in their favorite plush friend to spend the night in the library. Leiter documents the event with photos to show the kids when they return to pick up their toys the next day. When she’s not hosting activities with school children or stuffed animals, she often can be found pursuing one of her other passions: music. “I started playing piano when I was about 2. I started playing saxophone in junior high and did it all throughout high school and college,” she says. 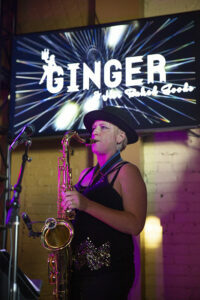 Currently, she plays saxophone in a six-piece band, Ginger and Her Baked Goods. They play a variety of top-40 pop, rock, funk and soul ranging from the ’60s to now. Leiter enjoys incorporating music into her programs, whether it’s her saxophone or a ukulele. Working at a branch location allows her to build relationships with the people frequenting the library, as well as for the patrons to build friendships, as well.